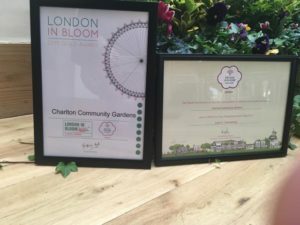 Feedback we had from the judge was sent to us (London, “Its Your Neighbourhood) showing how we scored in categories such as community participation, environmental responsibility, and gardening achievement. An excellent example of what can be done in a small and relatively confined space by a passionate group of people! Clearly the family-oriented gardening and engagement events are proving a continuing success, and the links with Charlton Park Academy are proving productive and sustainable. The community orchard in Charlton Park is a big achievement for the group, and they seem to be ploughing through any minor issues or problems and working hard to ensure it is sustainable and a community success. 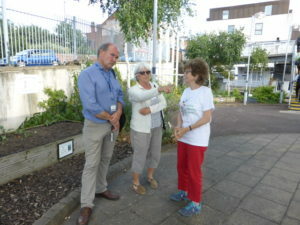 Hearing about the plant sale and what people say about it was really heartening, and shows that the group have a very sound rapport with the local community and are tailoring what they do to meet local needs and interests. People using the station and local streets are obviously aware of what has been done and are respecting the beds and the work of the group – there was very little litter (a new litter deposit frame and bag helps) and no evidence of any vandalism or misuse of the beds or area. The planted beds looked wonderful, and excellent use is being made not just of recycled materials and conservation of resources, especially water (e.g. 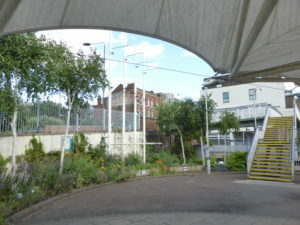 the water retention features and the wicking bed), but also the selection of plants to provide colour and diversity, but also for food and biodiversity. The plant name signage and other interpretation was lovely and appropriate for the site and the size of the beds. The submitted portfolio showed that the group has robust systems in place to maintain the station beds, but also other projects they are involved with, such as at Charlton Park for the orchard and with local schools. The portfolio also showed that the group has a strong sense of realism and practicality as to what can be done within existing capacity and resources, which is to be highly commended. That is the greatest achievement of all – knowing what the group can do and do well, and being realistic about what they would like to do further but avoiding over-stretching capacity and resources – they deserve high commendation for that. 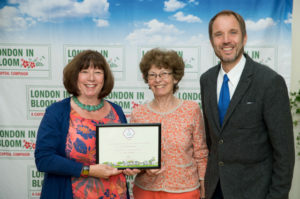 Receiving our Britain in Bloom (London) It’s Your Neighbourhood award – Level 5 outstanding. following up the ccg test website…. Thanks Sally, Your comments are much appreciated.